It’s almost time for Tiktaalik roseae to make another appearance on television. Tiktaalik is already extremely famous for an ancient fish fossil. It’s one of the best-known transitional species between fish that swim in the water and the first vertebrates to walk on land. It was first unearthed from Devonian-era rocks in the Canadian Arctic in 2004 and made a big splash when scientifically described in 2006 by the team of paleontologists who found it – including Ted Daeschler of the Academy of Natural Sciences of Drexel University, Neil Shubin of the University of Chicago and Farish Jenkins Jr. (now deceased) of Harvard University. The first episode has a firm local connection through Daeschler and the Academy, featuring scenes shot in Philadelphia and at northern Pennsylvania highway roadcuts where Daeschler looks for Devonian fossils closer to home. Get on Twitter. 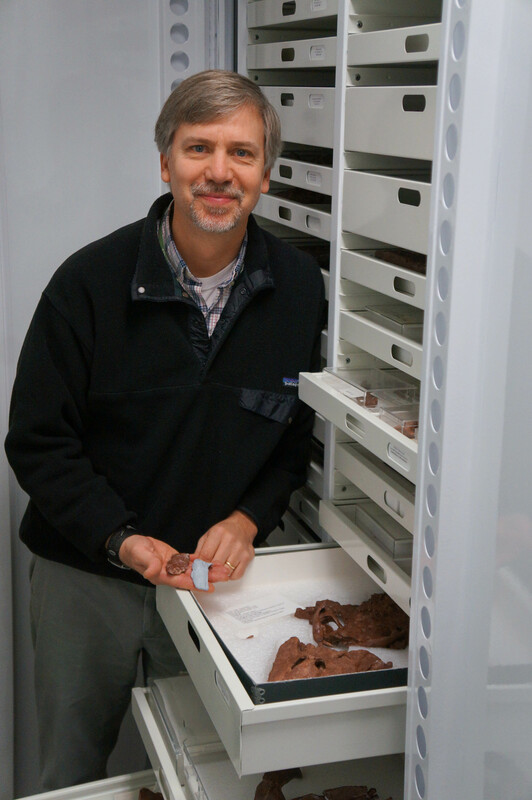 Daeschler will live-tweet the program on April 9, providing behind-the-scenes insights on Tiktaalik and the process of discovery. He’ll be using the Academy’s Twitter account, @AcadNatSci and program hashtag, #InnerFishPBS. (It’ll be his first time using Twitter, so Twitter pros, be patient with him!) His scientific collaborator, friend and “Your Inner Fish” program host/producer Neil Shubin will tweet on his own account, @NeilShubin, so look for conversations between them as they virtually watch the show together. Read about the behind-the-scenes process of filming last summer. It’s not every day that a field expedition for paleontologists going to the ends of the earth packs, among other things, a storyboard. You can read more about the process of capturing the Arctic footage in “Your Inner Fish” at the Academy’s website: Tiktaalik on Camera. Get to the Academy of Natural Sciences of Drexel University to see Tiktaalik fossils up close and in person! Tiktaalik fossils will be on display in the Academy’s Library Reading Room through the end of April. The Library Reading Room is typically open to the public only on weekday afternoons from 1-4pm, but this weekend only (April 12-13) it will be open on Saturday and Sunday as well – while the Academy’s exhibit spaces are overlaid with the floral exuberance of the SEPOS International Orchid Show & Sale.